I’m new to the forum, though I’ve been lurking and learning for some time. Here’s a project that wasn’t that hard in retrospect, but intimidated me when I started. It’s a Veritas Twin-Screw vise. I made the jaws from rock maple (given to me by my grandfather when he had to leave his workshop, and house) and jarrah. Though I had the maple sitting in various shelves in various houses for about seven years, the actual build took probably four weekends total (four weekends being maybe 15 hours—I have small kids). The Veritas instructions are great, and the first paragraph—about reading them even if you’re not usually the instructions-reading sort—is important. I studied them carefully, and often, and caught several mistakes before I cut wood. I made a couple of others (note the filler dowel to the left of the left screw hole in on the back jaw), but I have a smooth-running vise that looks (to me) great. 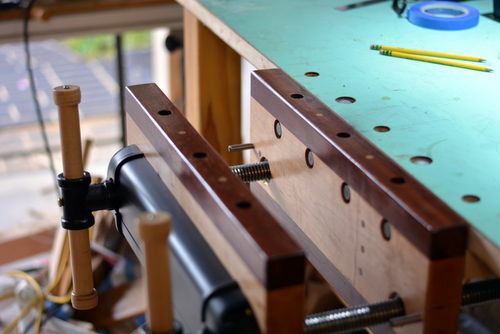 Their recommended way of mounting the vise—bed bolts—seemed overly complex and anyway wasn’t right for my thin temporary benchtop. I used plain carriage bolts. I still need to make some hardboard facings to protect the insides of the jaws. As well, I might add some pop-up dogs to the holes on the top of the outer jaw. Why, you ask, is a fancy vise like that mounted on the front of a particleboard door? This is part of my plan. The idea is that I will work out where I want dog holes and other benchtop features, including this vise, on the cheap door benchtop. I will then use that as a template to cut holes in a thick, solid wood benchtop when I’m ready. Already, the flex in the particleboard door is making me nuts. And yes, I know this is a strange place to put this vise. It seems like the right place for me, my small shop, and my way of working. We’ll see. Fault board makes great vise faces and most picture framing places usually have scraps they give away for free! I attach mine with 2 sided tape which makes for easy replacement. 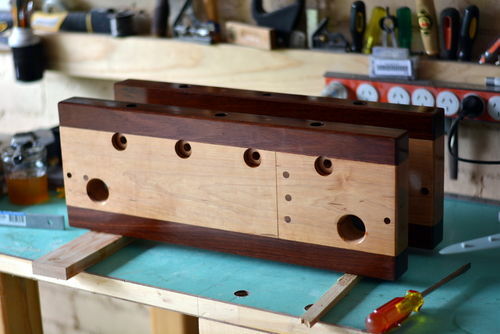 Nice looking Vise by the way. Thanks, Andre. What is fault board? Do you mean that matting stuff, sort of dense cardboard, that they put around photographs? That vise looks great. I’ve wanted to do that for some time but just too lazy to get it done. Good idea to take it slow and plan out your bench too. Good job. And, welcome to the site. Very nice vise you will enjoy for years, congratulations. Looks like a winner to me. Nice work HD. 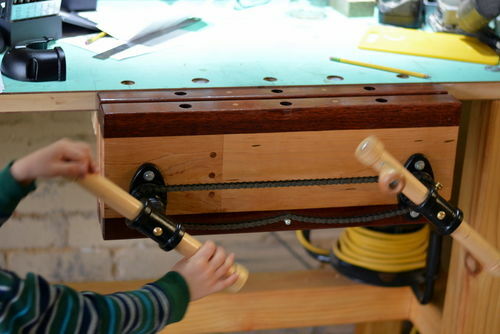 I put the same twin screw on my bench for an end vise. That looks great, love the combinations of colors and woods that would be a good scheme for a cabinet. 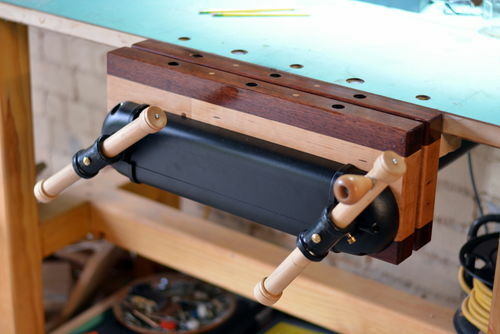 That’s one great looking vise! Wise I had one of those on my bench. 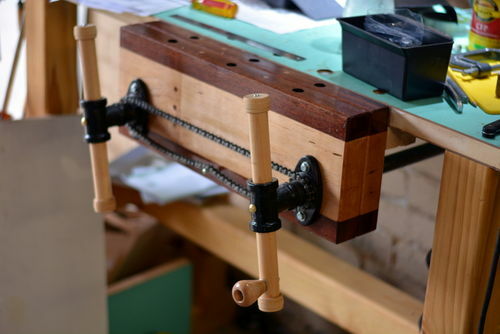 Great looking vise, I keep threatening to build a real nice bench and have this design vise. Your’s is a beauty. Really beautiful vise, great workmanship. Might I suggest a leather or cork facing on the inside of the jaws? Wood that hard can mar about anything with enough pressure. yes fault board is matting. Thanks, everyone. You’re all very kind with your comments. Agreed, I need soft facings of cork, leather, or cardboard. I want to make something taped or otherwise stuck in place for easy replacement. It was hard at work today, helping with panel glue-ups for my next project.